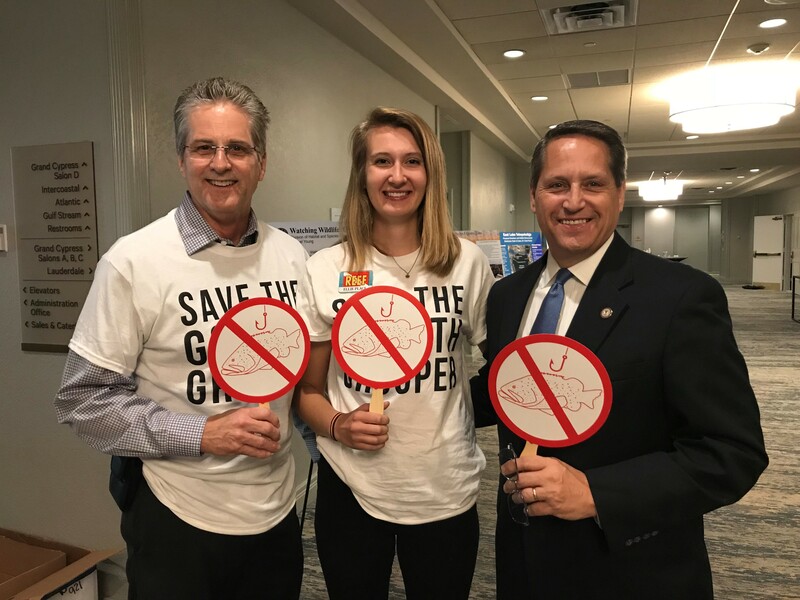 DEMA President Tom Ingram and Legislative Advocate Bob Harris, delivered written and spoken remarks in support of diving businesses during two days of meetings with the Florida Fish and Wildlife Conservation Commission (FWC) in Fort Lauderdale. Both Harris and Ingram provided comments on the need to protect sharks and Goliath Grouper in Florida waters. The meetings were standing room only and many DEMA-Member businesses attended the meetings on both days. During the meeting held on April 25th, DEMA provided remarks in favor of enforcing existing laws that prevent the intentional targeting and landing on shore of several protected species of sharks, among them Great Hammerheads and Tigers. The comments were necessary considering the actions of a small group of fishers in Florida who endanger protected shark species by deliberately using shore-based shark fishing to target and illegally land them, sometimes near public bathing areas. Landing and possessing many species of sharks in Florida is not legal, according to Florida Salt Water Fishing Regulations. DEMA asked FWC to consider the need for stronger enforcement of established regulations including revoking the fishing privileges of offenders. In addition, DEMA also asked FWC to adopt regulations that ban shore-based shark fishing in the vicinity of designated public bathing areas. Such a ban already exists for any spear fishing activities within 100 yards of Florida’s public bathing beaches, and the scope of this ban should include hook and line fishing as well. At the end of this meeting, Commissioners instructed FWC staff to initiate the process of rulemaking, with the goal of ensuring the protection of these at-risk sharks. The process may also address the issue of fishing in proximity to public bathing areas. During the meeting held on April 26th, DEMA, along with 57 additional attendees spoke in opposition to the possibility that FWC would lift a 28-year moratorium on harvesting the protected Goliath Grouper, including the possibility of a “limited harvest” to provide fishing opportunities in the fishing community. Goliaths, which are listed as “critically endangered” by the International Union for Conservation of Nature (IUCN), remain at risk and there remains no valid science that assesses the current stocks of these fish. In addition to the lack of the good science needed to consider a change in the Goliath’s status, dive operators from all over Florida have enjoyed the tremendous business boost provided by divers’ desire to see these gigantic and slow-moving fish. Some operators indicate that 25% of their revenue comes from people coming from all over the world to participate in this world-class diving opportunity. Economic studies indicate that divers are willing to pay up to four-times the amount of money to see the Goliath ($336.00) as compared to fishers who indicated their willingness to pay $79.00 to catch one. 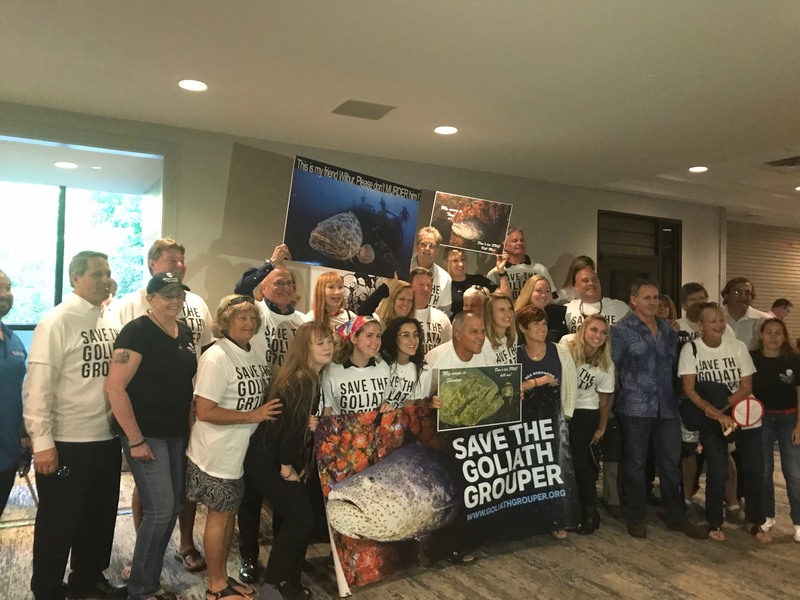 DEMA provided the dive stores and divers commenting in opposition to lifting the moratorium with “SAVE THE GOLIATH GROUPER” t-shirts, and signs to remind Commissioners of the value of these important and endangered animals. Asking FWC to maintain the current prohibition on harvest and possession of Goliath Grouper in Florida. Requesting that FWC, NOAA, or another appropriate agency or scientific organization undertake a more thorough stock assessment of the Goliath Grouper, to include research on the AGE of Goliaths. Requesting that the Commission reject any recommendations to implement a “limited harvest” of these fish, especially as the FWC staff indicated that such a limited harvest “serves no valid data collection purpose” and would raise consumption concerns because of high mercury levels in large Goliath. Asking FWC to put protections in place for Goliath Grouper which are commensurate with the reasonable protections currently afforded manatees. DEMA also quoted DEMA’s own surveys of divers and dive professionals conducted in 2017 which indicated that more than 69% of ALL DIVERS favor continuing the moratorium, 64% of DIVERS IN FLORIDA favor maintaining the moratorium, and more than 77% of DIVERS TRAVELING TO FLORIDA favor it. Commissioners, in response to this outpouring from the diving community determined that the harvest moratorium would remain in place. However, Commissioners asked FWC staff to develop a plan, by the end of 2018, to suggest how the FWC may move forward, with the consideration that harvest of Goliaths might, in the future, be reconsidered. DEMA will continue to watch developments in these critical diving issues and has offered to be a resource to FWC to assist, especially in understanding the economic value of these fish to dive operators and Florida tourism.